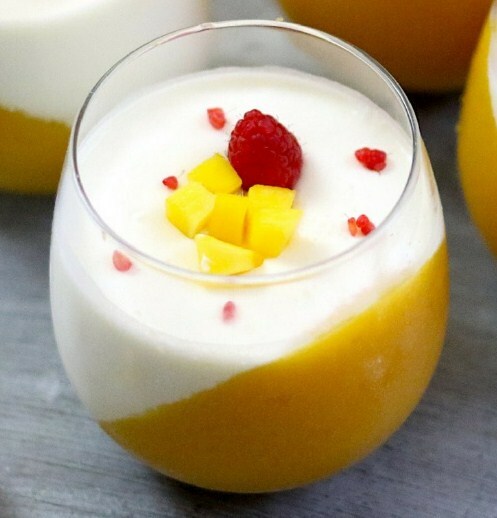 In a small bowl, add mango juice and sprinkle gelatin on top. Wait 5 minutes for gelatin to soften and then mix. Microwave on high for 1 minute and stir again. Set stemless wine glasses or tumblers on an angle in a muffin tin. If the glasses slide, place a small towel underneath to help stabilize. Mix together the mango puree and mango juice mixture. Pour into glasses to a half inch below the rim. Chill in position at least 2 hours to set. In a medium sized saucepan, add milk and powdered gelatin and wait 10 minutes. Top with optional raspberries and diced mango. Serve and enjoy!